Almost a year ago, the Regional Accelerator and Innovation Network, known as RAIN, was created to support entrepreneu rs in the southern Willamette Valley and mid-Coast region. The aim is to launch early-stage businesses and turn them into high-growth companies that will help generate jobs and prosperity in our region. The governor’s Regional Solutions Office was the catalyst for RAIN. Its original leadership team included Eugene Mayor Kitty Piercy, former Corvallis Mayor Julie Manning, state Sen. Lee Beyer — chairman of the Regional Solutions Advisory Board — and the vice presidents of research at Oregon State University and the University of Oregon. This group understood that to succeed, higher education, government and the private sector must work together to create an environment where innovation is encouraged, and where startup and early-stage companies receive the support they need to put down roots in our communities. Initially funded with $3.75 million from the Legislature and a commitment by RAIN partners — OSU, the UO, Corvallis and Eugene — to match those dollars, this unprecedented Oregon economic development partnership attracted additional partners, including the city of Springfield, Lane County, the Eugene Area Chamber of Commerce, the UO Foundation, the Lane Workforce Partnership and private donors. Together the RAIN partners supported the excellent work already started by the OSU Advantage Accelerator in 2013. 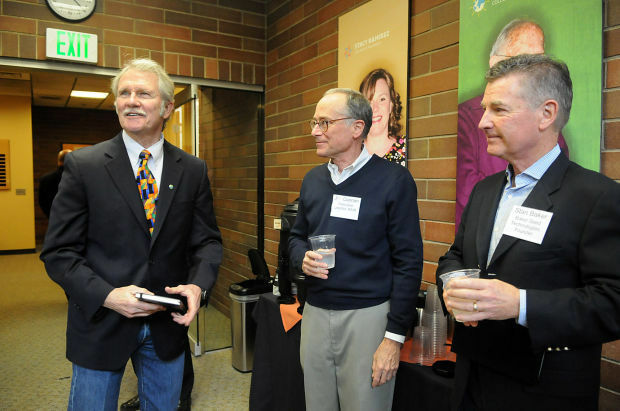 Today, the Advantage Accelerator partners with RAIN Corvallis to further this work. Similarly, in 2014, the RAIN Eugene accelerator was launched. It is managed by the UO and the Eugene Area Chamber of Commerce. RAIN Corvallis and RAIN Eugene offer two rigorous educational opportunities during the year for select early-stage companies that were started by faculty and/or students at either university, or by people in the region. To date, 48 companies have entered the accelerators, receiving intensive classroom education, access to work space and help with business plan development and evaluation — as well as mentorship by successful entrepreneurs and networking opportunities with professional service providers and potential investors. Graduates of the RAIN accelerators are already making a difference. RAIN companies have created 30 new full-time jobs and generated $5.2 million in new local revenue. These companies have benefited from the dozens of mentors who have volunteered their expertise and time, and from students at OSU and the UO who have gained valuable business experience while working as interns. In addition, $750,000 of new investment capital has been created by the RAIN network to provide seed capital for the region’s startups. RAIN’s momentum gained a boost earlier this year when the city of Eugene and the UO joined forces to begin converting a previously underused downtown building into a permanent home for the RAIN Eugene Accelerator, which will be co-located with the UO’s Tyler Invention Center and the Department of Product Design’s Innovation Launch Lab. This innovation hub for local start-ups is intended to create a link between the campus and Eugene-Springfield’s growing technology sector. As part of its funding agreement, RAIN matched the state’s $3.75 million investment. In fact, RAIN has exceeded the match by more than 25 percent, including a $300,000 National Science Foundation Innovation Corps grant recently awarded to the OSU Advantage Accelerator and RAIN Corvallis. The grant will fund curriculum to prepare the region’s early-stage companies to participate in an accelerator. OSU is one of only 36 academic institutions in the nation to be named an NSF Innovation Corps site. RAIN has also been recognized by the International Town and Gown Association, which honored the initiative with an ImpACT award for the UO and the region’s growing economic development partnership. The award recognizes leaders of innovative initiatives involving city and university partners. Perhaps more importantly, RAIN is creating the buzz necessary to captivate new investors and excite the next iteration of entrepreneurs. With RAIN’s support, essential ingredients are coming together to create the next generation of high-growth companies to support our region’s need for jobs that pay a living wage. RAIN remains the top regional priority for the governor’s Regional Solutions initiative, which will leverage dollars from public and private funding partners to help turn ideas into successful companies for our region. Given RAIN’s success finding funding for its efforts, it has asked for a substantially smaller amount of money from the state for the next biennium, but still needs support to build on its early gains. As local and state governments consider funding for the next fiscal year and beyond, they can appreciate and understand that RAIN is an investment that is already paying dividends — and with their support, RAIN will generate bigger payoffs in the future. RAIN is a testament to what can be accomplished when communities, universities, governments, entrepreneurs, and the private sector work together. Jim Coonan is executive director of the Regional Accelerator and Innovation Network.